A dystopian future novel set in Belfast after an alien invasion is a premise that immediately appeals and suggests a whole host of imaginative ideas. Inish Carraig is the second book from Jo Zebedee and sets humanity as a conquered plaything between two spacefaring alien civilisations; the Zelotyr and the Barath’na. With the events of the book set where they are, the opportunities for a District 9 style allegory are clear right from the outset, particularly as the opening scenes are of scavenging teenagers John and Taz forced to work for food for themselves and their families. The book doesn’t play this card as well as it might, but instead we have a robust dystopian story that sticks with its underclass characters for the most part as they struggle against the circumstances thrust upon them. John is an unwitting rebel who may have doomed humanity to never recover from the devastation of invasion. Taz, an ignorant victim of trying something he shouldn’t and Josey, an unwilling captive of consequence. Joining these is Inspector Carter, a policemen forced to collaborate with both aliens in turn as the jurisdiction of Earth changes hands. Carter’s position of power is revealed as powerless owing to his own inability to take risks as much as the ‘middle management’ confines of his role, but ultimately he finds courage and opportunity to take matters into his own hands. The Zelotyr and Barath’na are less well defined than the human characters, the former having invaded Earth owing to environmental problems with their own planet and failing to recognise the intelligence of the indigenous species, the latter seemingly a neutral arbiter between invader and victim, although the relationships between the three are clearly much more complex than this, as we find out. The Inish Carraig of the title is a hastily constructed prison, built by the Barath’na for malcontents and revolutionaries, again, something that could offer more of a real world allegory. The pacification of its inmates through drugs administered by implant, along with the threatening carnivorous presence of the Barath’na themselves implies a more sinister motive to everything which bears out as we learn more of the wider political games being played. There are one or two bumps in the narrative; a ‘galactic council’ of two struggles to live up to the name and the use of robot companions as a plot lever might be considered a little bit obvious, but neither are story breaking and the perspective is kept tight and dramatic throughout. Inish Carraig is a gritty post invasion novel. There is a tense realism to the key scenes of conflict and some supporting cast manage to maintain a position of ambiguity right up until the end of the book. Scenes in the dark countryside where life becomes a desperate struggle from one moment to the next are chillingly real. The truest monsters in the text are particularly awful examples of humanity. Occasionally events seem to move forwards from off stage, which is a little confusing to the reader who might be used to their viewpoint characters adopting a more driving role, but this echoes writers like H.G. Wells in some ways, where the main character is not always the changer of the macro plot. The conclusion of the book is nicely brought together, but does make the reader reflect on what we have gained. In many respects, our analogue - humanity, under an oppressive alien government has not changed its fate, but made its future worse, although, the individual characters have escaped the cold endings that awaited each of them. 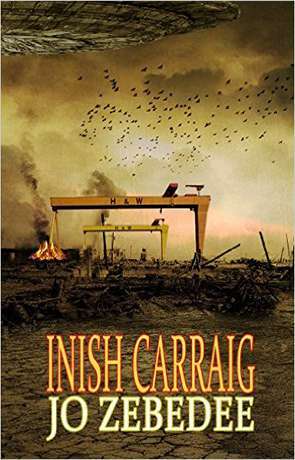 Inish Carraig is a good alternative take on the dystopian novel and establishes an intriguing premise that may be worthy of Zebedee exploring further in the future. Written on 14th October 2015 by Allen Stroud.